First Place Finishes at 2011 SAMPE Baltimore-Washington Regional Student Symposium at UMBC on February 9, 2011. From Left to Right: Mr. Andrew Becnel (G), Mr. Shane Boyer (UG), and Prof. Norman Wereley. 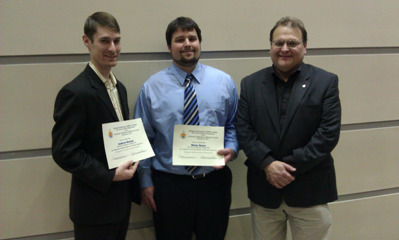 Aerospace engineering students from the Composites Research (CORE) Laboratory were awarded accolades at the 2011 SAMPE Baltimore-Washington Regional Student Symposium hosted by Prof. Marc Zupan and held on February 9, 2011, at the University of Maryland, Baltimore County (UMBC). Students from the University of Maryland at College Park, University of Delaware, the University of Maryland at Baltimore County, and University of West Virginia, presented their research in composite materials and competed in poster and oral presentation categories. Mr. Shane Boyer (UG?11) earned First Place in the Poster Presentation category for his paper and presentation entitled "Chord Morphing Wing Utilizing Composite Sandwich Structures and Pneumatic Artificial Muscles." Mr. Boyer is currently a senior in the Aerospace Engineering Honors Program and a Vertical Flight Foundation Fellow. Mr. Andrew Becnel (MS?10) earned first place in the Oral Presentation category for his paper and presentation entitled ?Magnetorheological Fluid Composites for Crashworthiness Applications in Helicopters.? Mr. Becnel is currently a doctoral student and NDSEG Fellow. Norman M. Wereley, Techno-Sciences Professor and Associate Chair, is the research advisor for both students. Mr. Boyer and and Mr. Becnel were both awarded certificate plaques, and a cash prize of $500 for their efforts. Mr. Becnel is a finalist, and Mr. Boyer is a semi-finalist, for the SAMPE National Student Symposium to be held at SAMPE 2011 in Long Beach, CA, from May 23-26, 2011.